Regardless of one’s place or status in life, it would be a privilege and an honor to be photographed with the President of the United States. The historical society museum is fortunate to have a fantastic photographic representation of presidents dating back to 1901 when William McKinley became the first sitting president to visit Los Angeles. 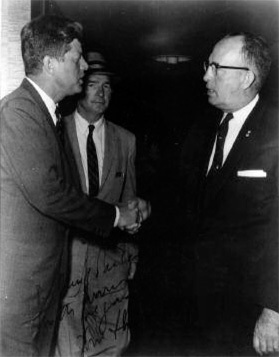 These photos also feature LAPD personnel with the various presidents. The historical society now proudly displays a photo array beginning with our softhelmeted early twentieth century officers escorting President McKinley’s flower adorned carriage. Of course, it concludes in more modern times with a photograph of Chief William Bratton and President George W. Bush. Presidents Wilson, Eisenhower, Kennedy, Johnson and Nixon were also captured photographically. Their images with various members of the Department complete the current display and help to illustrate the link between police officers and their Presidents. This undertaking was done in partnership with a team of dedicated students from the Wilson High School police magnet program and supported by a grant from the History Channel. While researching and assembling the material for this wonderful exhibit, one of history’s mysteries came our way. As the grant project commenced, the first negative uncovered here was one of Chief Parker and President Kennedy, truly a piece of history and an auspicious start to the project. While work continued, an 8×10 photo was located. The reverse of the photograph indicated that the picture had been airbrushed. Given that the photo dated to 1962, the expectation was that the airbrushing was simply cosmetic, an effort to clear a blotch or perhaps a blemish. More work in the photo archive uncovered the original, unmodified photo. The airbrushing may have started with a blemish, but it wound up as the photographic equivalent of a mob hit. A male in a hat, depicted to the center of Parker and Kennedy completely disappeared. So, besides these great photos, we were left with our own whodunit. Granted it wasn’t about an unknown assassin perched on a grassy knoll, but is was a mystery nonetheless. Who was removed from the photograph? And why? Anyone of our faithful readers who may recognize the man in the middle of the photograph, please let us know. We would love to hear the story. Seemingly, the sensible transition from the cover of this newsletter to this column would be material about the LAPD and Presidents. So as not to disappoint the readership, we happily report on the historical society’s most prominent link to Presidents past, the Ronald Reagan Library and Museum. Late October, 2005, saw the public opening of the Air Force One Pavilion at the Reagan museum. This section of the Reagan Library is the home to his presidential aircraft, set-up to allow visitors to tour the inside of the airplane. For both the Department and the historical society this was a much anticipated event because of our mutual involvement. A restored black and white police car and two restored police motorcycles were donated to the Reagan museum for placement in front of the Presidential limousine. Along with a secret service-donated suburban, the vehicles help to replicate a Reagan-era Los Angeles motorcade. Since its opening the Air Force One pavilion has been swarmed by visitors. Given that our Wilson students were attending a high school named after a President, and they were participating in an exhibit devoted to police officers and Presidents, this seemed to be a logical location for them to continue learning about the interaction between law enforcement and the nation’s leader. With the assistance of the Reagan library staff, the students, our directors and volunteers were treated to a tour of the Air Force One Pavilion and the rest of the Reagan museum. After walking through the Presidential aircraft, and viewing our contribution to the motorcade, it became clear why the Reagan museum is swamped with visitors. Truly unique in design and executed with perfection are the fitting descriptors for the pavilion. Being included in this world-class exhibit is an honor. This places LAPD where it belongs, proudly displayed on a national stage. We thank the Reagan library staff for the wonderful opportunity. My advice, make time to visit them soon. The museum has had its share of notable visitors in the recent past. One of them made his way to us from Milwaukee, Wisconsin, home of Harley-Davidson, the place where Bob Foreman reports to work. Bob handles the worldwide sales of Harleys to police agencies. We were fortunate to have time to discuss the Department’s history and current transition to Harley police bikes. The department started out on Harleys in the twenties, as did our photos. Through the years, motor officers on Harleys are captured in some truly unique photos. of the museum is the home to our very own Kawasaki, restored to reflect the riding days of Sergeant Ken Tennesen. 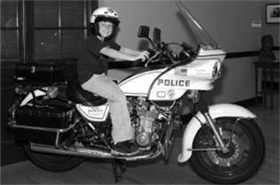 The motorcycle is displayed in his honor and has proven to be very popular with visitors, particularly the younger set. Their smiling faces let us know that sitting on a police motorcycle is quite a thrill. A few weeks ago, I addressed a group of volunteer docents at the Autry museum. The Autry National Center is one of a number of great museums located here in Los Angeles. Like the Autry museum, we are fortunate to have a contingent of dedicated volunteers that assist with everything from running the museum store to leading tours to doing research to support our operations. To these truly devoted and helpful folks, we want to extend our thanks for all of the fine work they have done in the past year. And, from Gail Ryan comes a reminder of the upcoming Newton Reunion, August 26, 2006, at the Elysian Park Academy at half past noon. This date falls just before one of our important dates this year. The thirteenth annual Jack Webb Awards is scheduled for September 9, 2006, at the Sheraton Universal. Details to follow in upcoming issues of the Hot Sheet. Anyone interested in joining our ranks of volunteers please contact us. Currently we have a need for a volunteer with some serious woodworking skills and tools. If you are interested in helping out with exhibit construction, we would like to talk to you soon. One of the truly unique activities in the past couple of months relates to the many changes happening at Parker Center. By now, everyone should be aware that there is a new police headquarters building in the Department’s future. PAB’s replacement will be located a couple of blocks away, but some of the other components will remain at 150 North Los Angeles Street. Department communicatins will remain in their building at First and Los Angeles. Since construction is underway on the expansion of jail division, the new jail facility will remain where it is. Despite the relocation, some other changes to PAB were required to continue its service. This is where we came in. The lobby of Parker Center recently received some great new improvements. A new front desk was installed and some other more minor cosmetic improvements took place. Still to be completed is a remodel of the canteen in the lobby of Parker Center. In order to accommodate the canteen’s storage needs, the unused projection room at the rear of the auditorium seemed to fit the bill. For those that never made it into this particular area of headquarters, three fifties vintage movie projectors and all the cinematic necessities have peacefully resided here for quite some time. From the historical perspective, there is of course, a neat little story to go along with the projectors. At the time, the Police Commission licensed all theater projectionists. This was a time when the projector light was supplied by rods very similar to those used in arc welding. Improper use meant a fire hazard, potentially to a crowded theater. In order to receive a projectionist license, the prospective projectionists were tested on the projector in the Parker Center projection room. Those projectors now have a new home at the museum. Currently we are considering their disposition. Anyone who may be a collector of full-size movie projectors may want to give us a call.